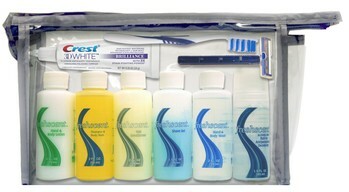 This 10-piece kit includes personal hygiene necessities conveniently packaged in a zippered, reusable vinyl travel bag. Fresh Scent products such as 2 oz packets of shampoo, conditioner, hand and body lotion, bath gel and liquid soap are included as well as a 1.5oz alcohol-free roll-on deodorant. It also contains a toothbrush, Crest Toothpaste, a Fresh Scent shave gel and a twin blade razor. 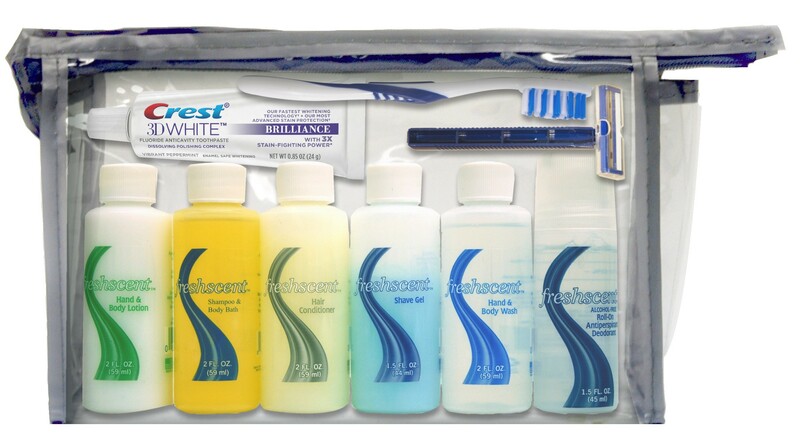 This kit provides all the essentials you need to care for yourself when your normal means to do so are not readily available, such as when you are traveling or dealing with an emergency situation.